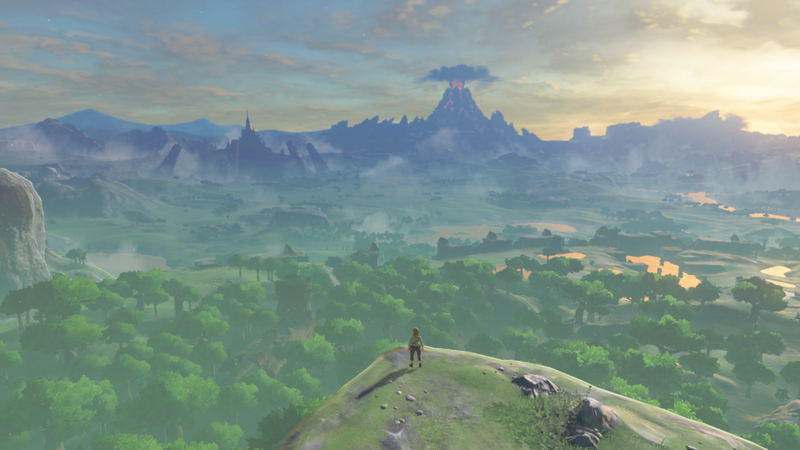 Ever since it was first properly shown at E3 last year, we’ve been flooded with media from The Legend of Zelda Breath of the Wild. From the full day Nintendo Treehouse stream to the Switch presentations and the daily media posts by Nintendo’s Twitter account, we’ve now seen tons and tons of this great game. But there’s even more coming! 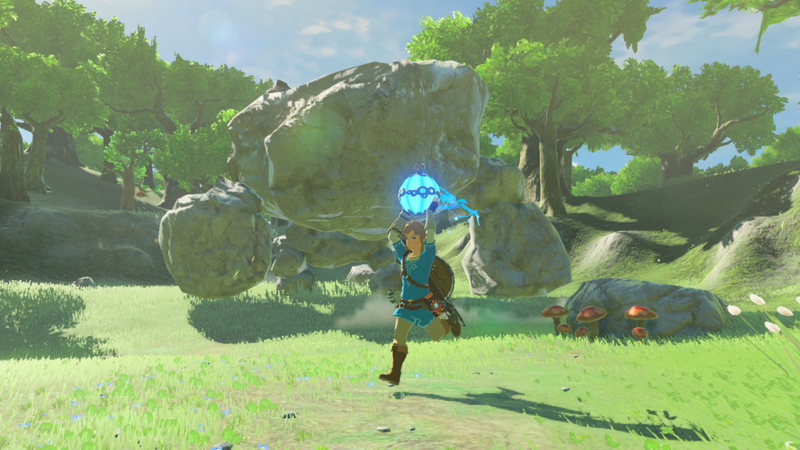 Including, a whole new gallery of screens showing even more of The Legend of Zelda Breath of the Wild. So sit down, get a cup of tea and enjoy the screenshot gallery! 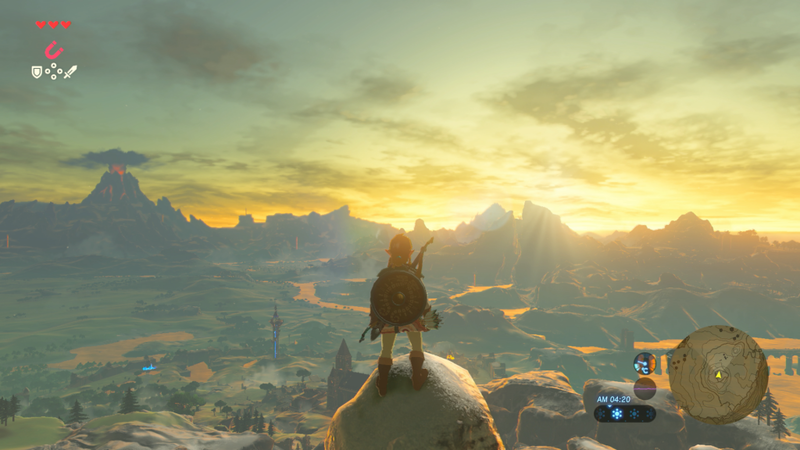 Starting with this beautiful looking scene of Link looking over Hyrule at dawn. Really, the lighting effects in this game look astounding! And that carries over to the shrines too. Just look at the eerie blue glow from the block and torches here. Very cool. Onto a stable now. 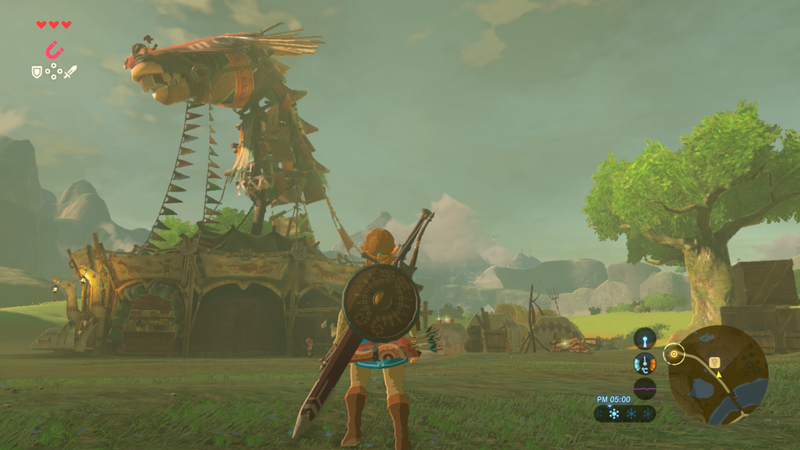 As you can probably guess by the giant horse head above it, this is where your horses will get stored in The Legend of Zelda Breath of the Wild. It’s been seen in a bunch of Nintendo videos anyway. This building and character however… hasn’t been. Hmm, she looks like a fairly wise old sage if you ask me. 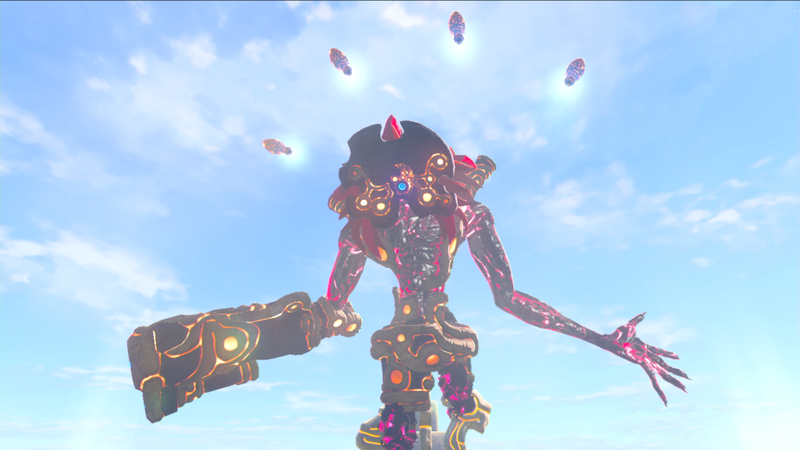 Which is not something you can say about this boss. 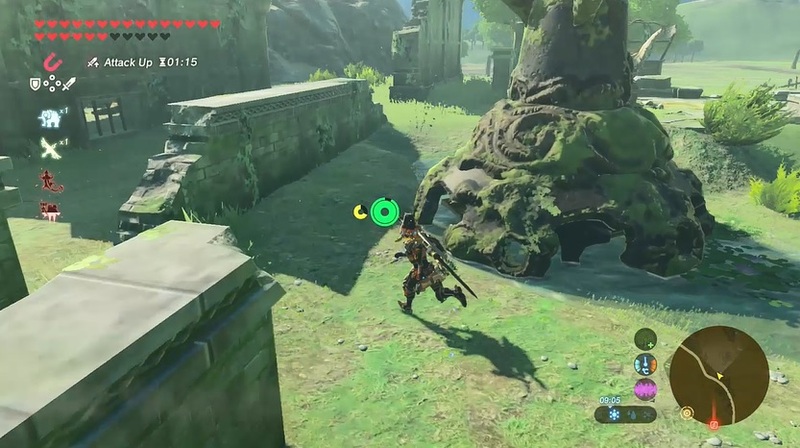 Apparently this was shown in Game Informer’s preview of the game, and is named after Calamity Ganon. Maybe the dark lord is controlling these figures himself? Back to shrines now though. 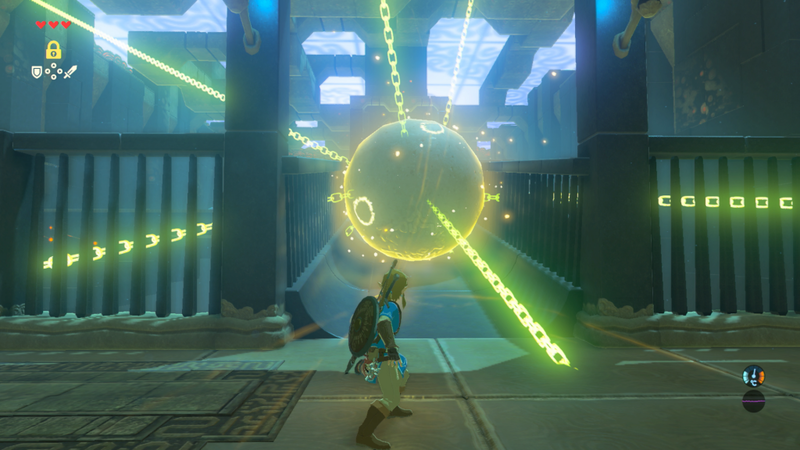 With what appears to be a ball moved by the Stasis ability. And hey, it’s this guy. 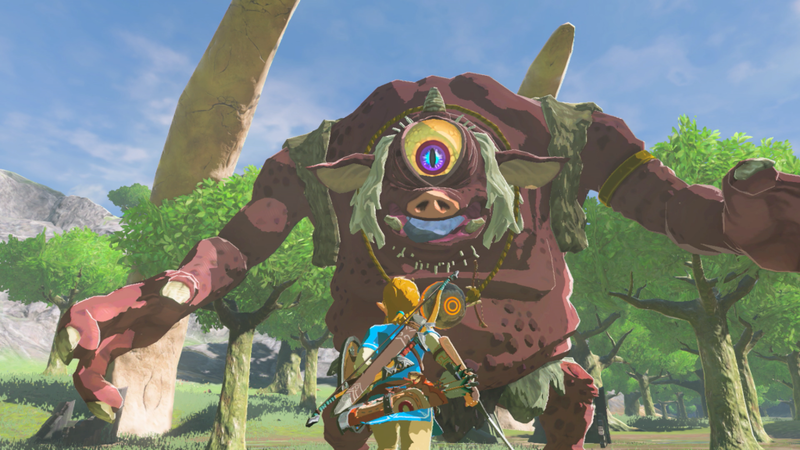 Zelda Wiki says this is the new design for the Hinox in this game. Still, we’ve seen that stuff already. This area however looks a bit different. Is this what’s inside a stable? 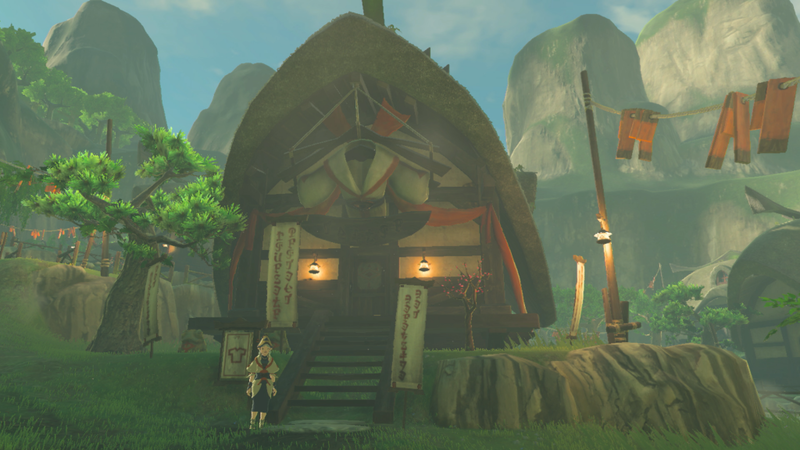 Or is this just a random building in a village? 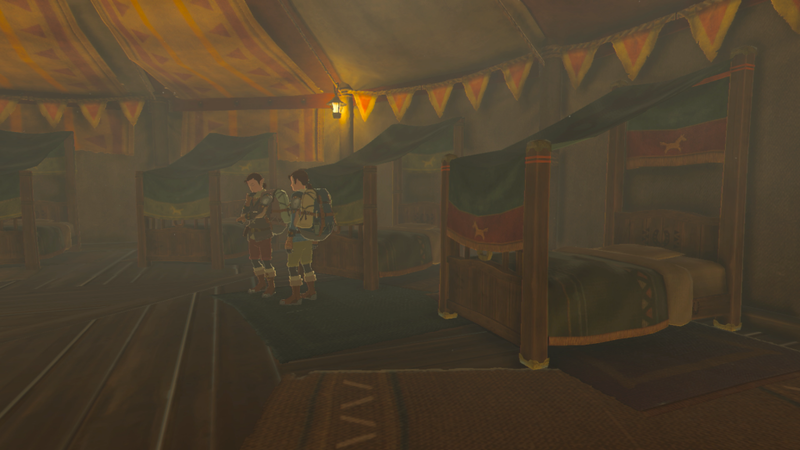 And heck, who are the two NPCs here? Oh well, moving on. 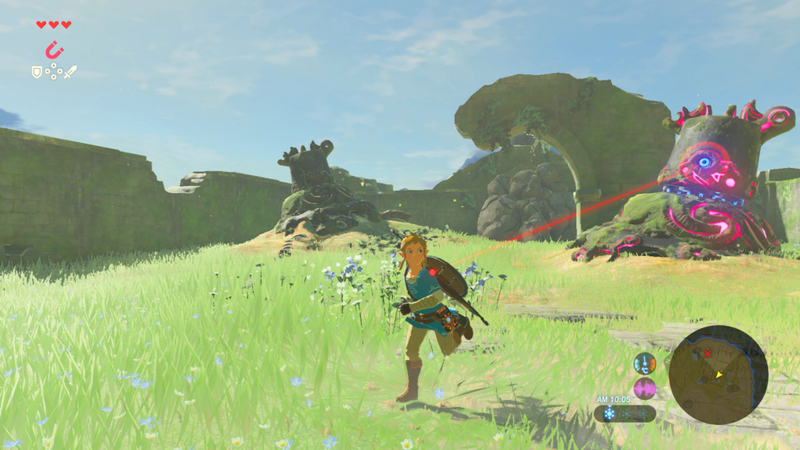 Here’s Link running from a partially deactivated Guardian in the Great Plateau. 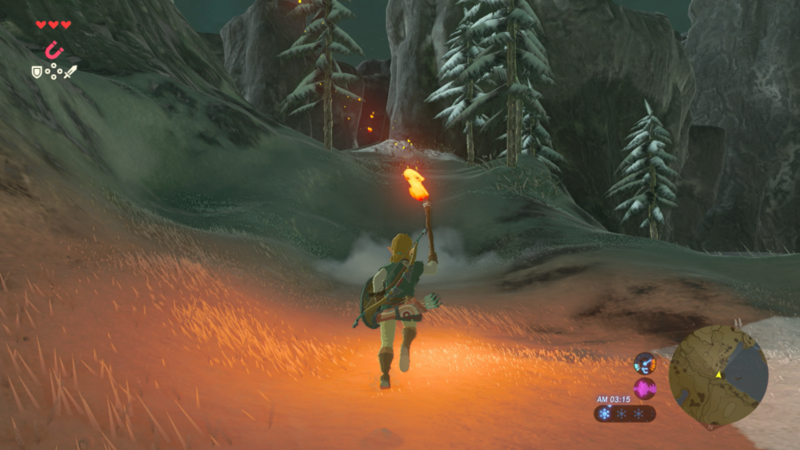 As well as him going towards the snowy mountains with a flaming torch. Well, that is one way to stay warm. Even if you do look like a one man angry mob in the process! 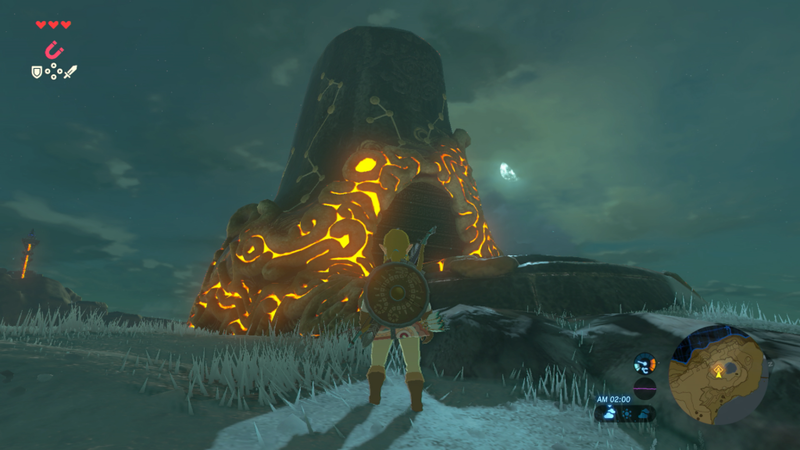 Either way, this is probably the shrine he was intending to reach in the last image. The scenery looks cold and barren enough. But hey, at least this place is fairly lush. 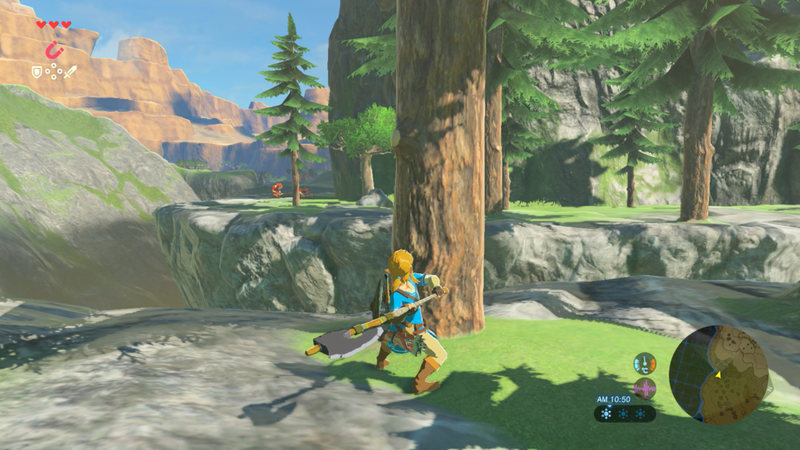 Pity Link’s just chopping trees here now. Let’s move on. 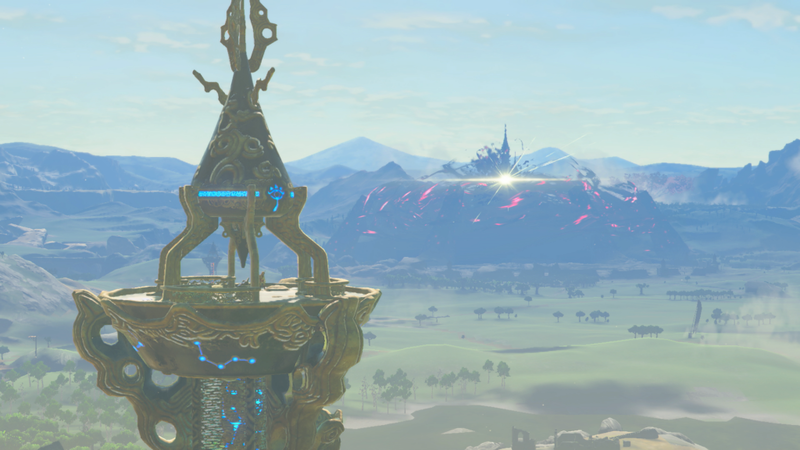 To this nice scene of the Resurrection Tower and Hyrule Castle. Gee, this game really does let you get some great views of the world around you, doesn’t it? It also lets you do all kind of other things that your average game doesn’t. Like walk on fallen trees you’ve chopped yourself. Yeah, I know it was shown off at E3 last year. But still, it’s an impressive use of the physics engine. The physics engine isn’t the only impressive thing either. 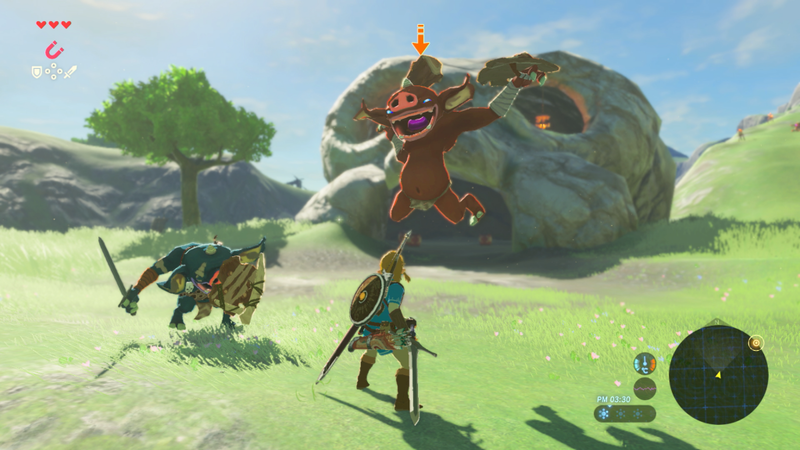 The AI is supposedly much better now, with Bokoblins like the ones here acting more life like than ever. And let’s not forget about the weather. Just remember that lightning aims for the tallest object, and that metal conducts electricity perfectly. 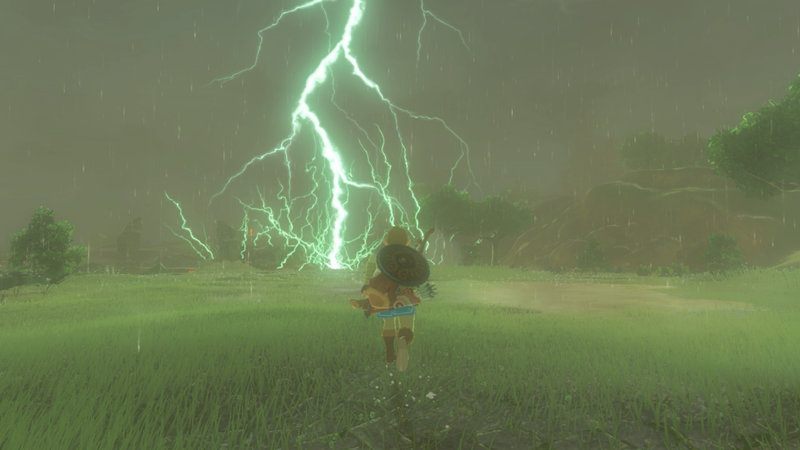 Better not wear armour in a thunder storm Link! 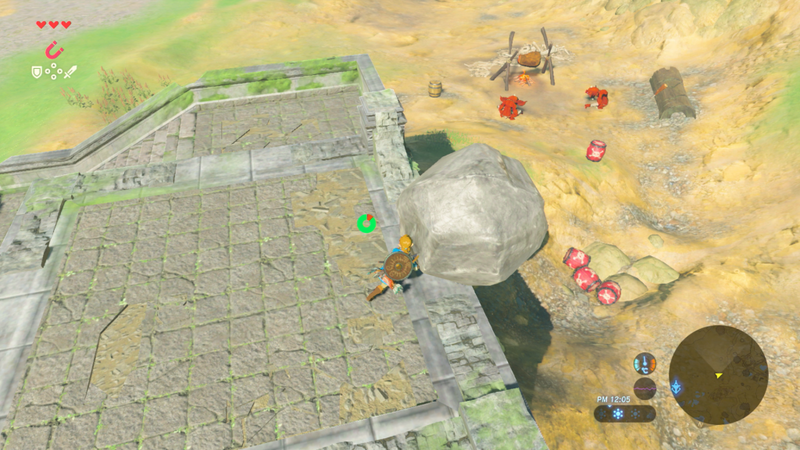 Though hey, pushing large boulders onto enemies is fine. Especially when they set off a bunch of exploding barrels in the process. 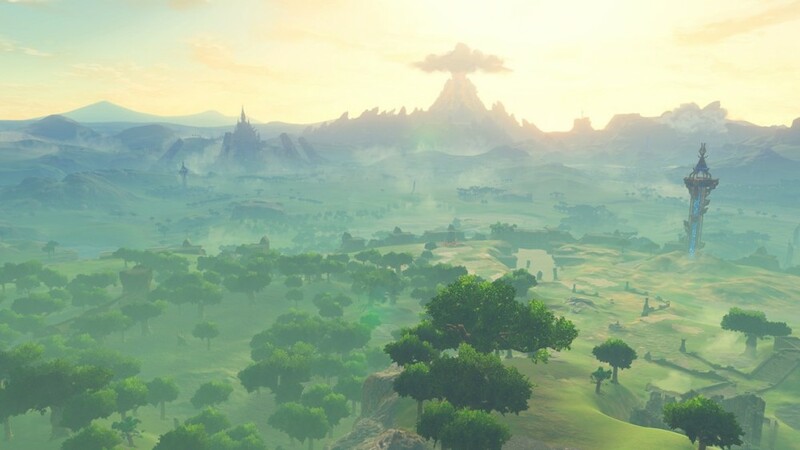 But still, back to looking at the world of Hyrule. This game makes for some real nice panorama shots, doesn’t it? I should have something to say about this picture. 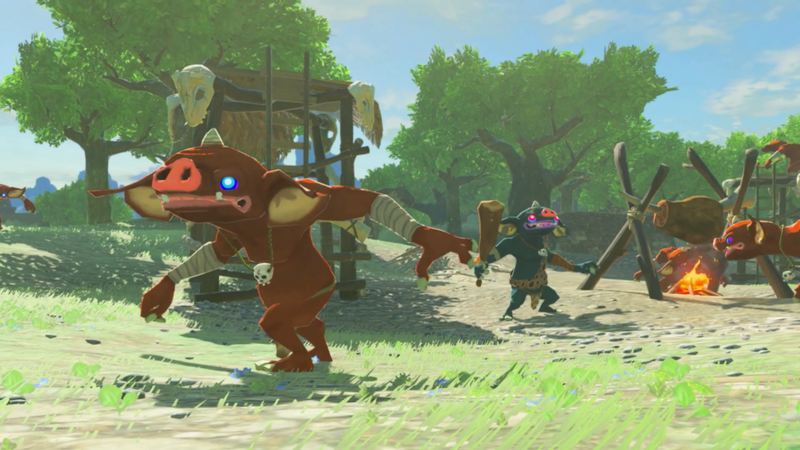 Like the Bokoblin’s expression. But alas, I do not. 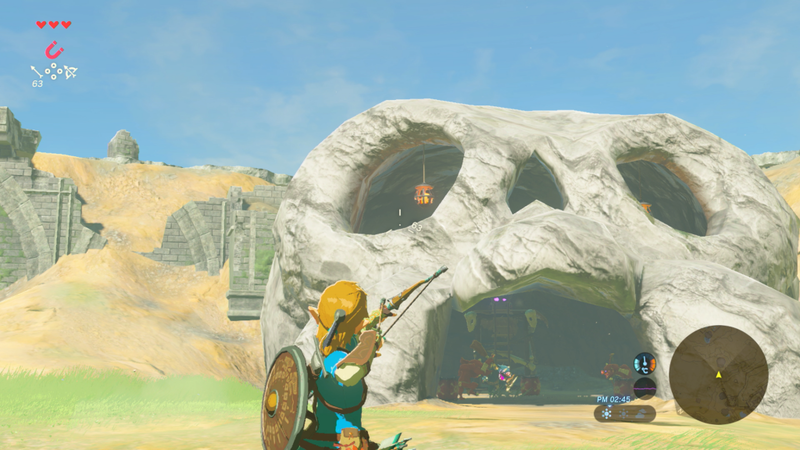 Though this exploding skull shaped hideout looks nice. 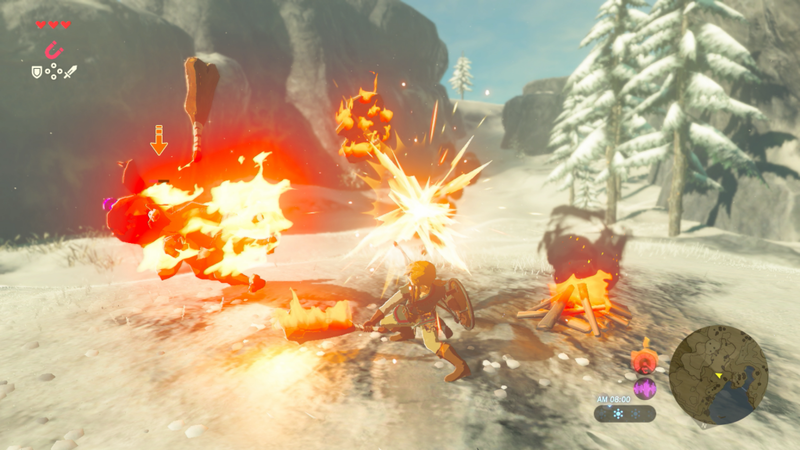 Pity the Hyrulean Army aren’t strategic enough to do something like this. Enough about them for a minute. 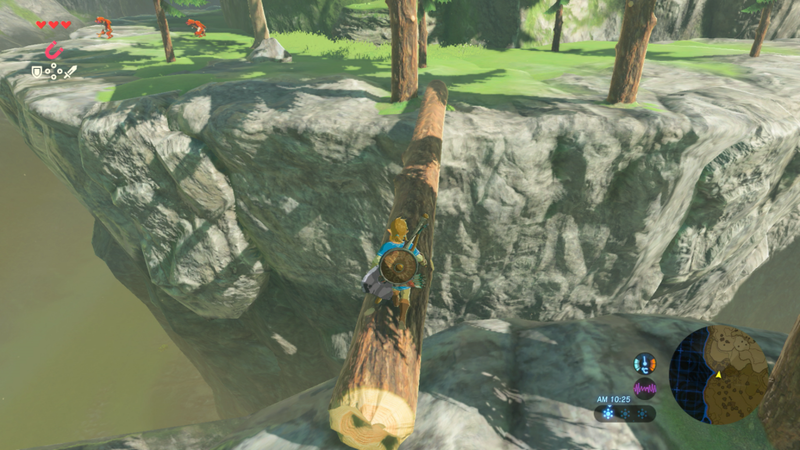 Let’s look at Link staring at a bundle of sticks. 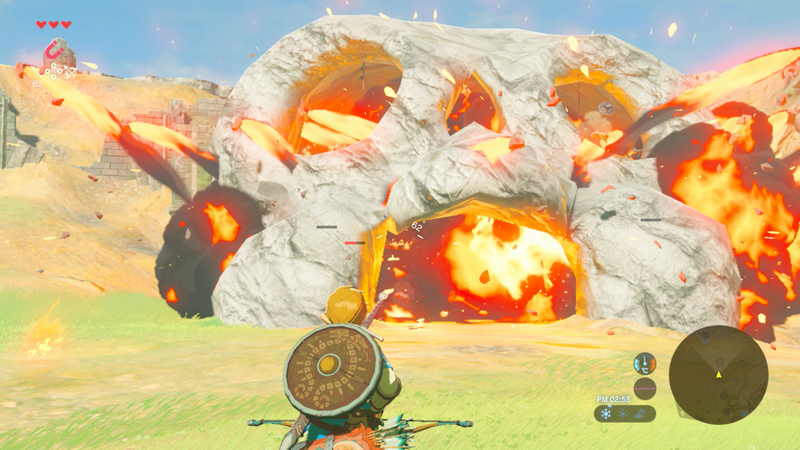 In front of the ruined Temple of Time. 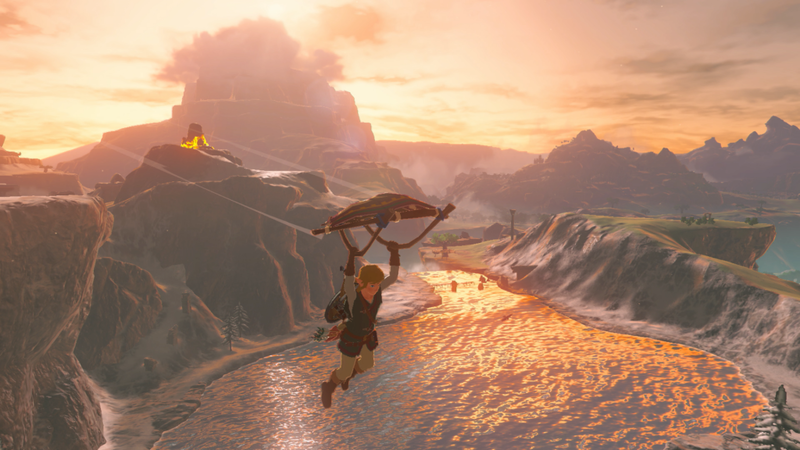 Or this lovely sunset view of Link gliding across a river. 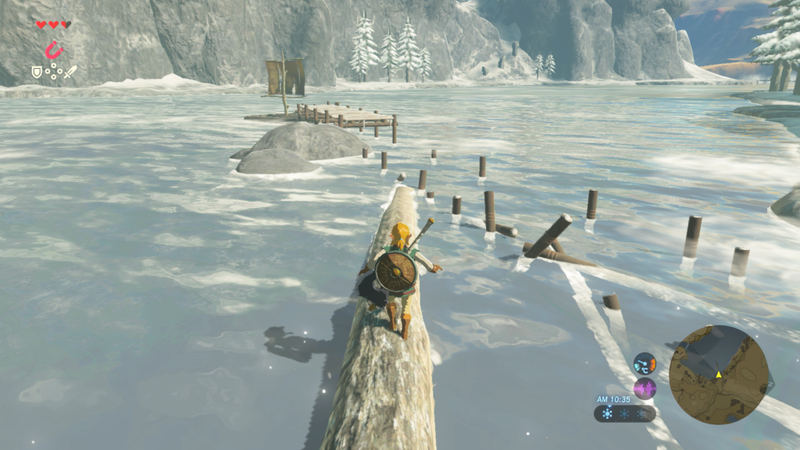 Or maybe Link walking across this log in a beautiful snowy landscape. Really, this game looks damn impressive. Ah, so this is what happened before the skull shaped hideout exploded. 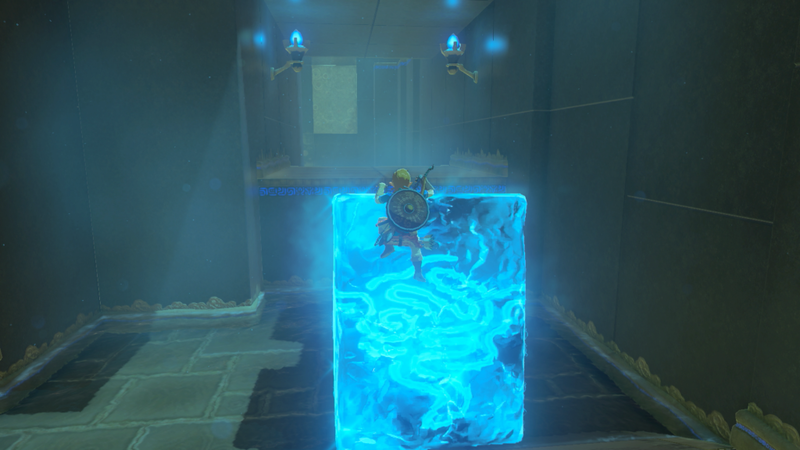 Whereas this is Link taking out Steppe Talus. 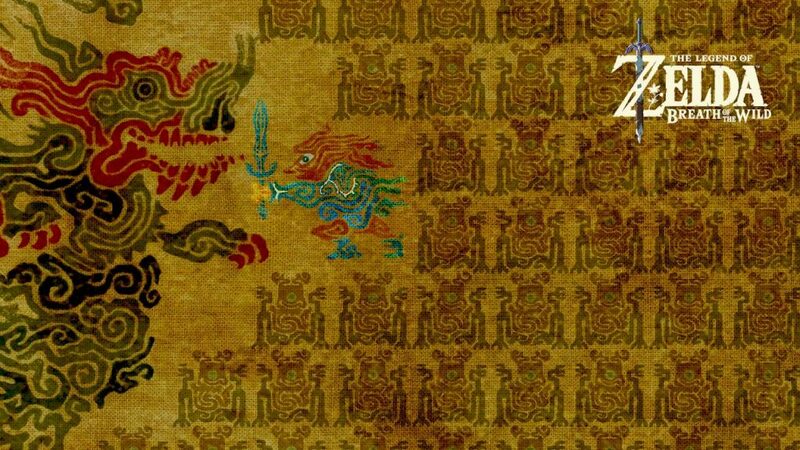 And finally, this is apparently the game’s loading screen. You know, the one you’d see between selecting it from the menu and reaching the title screen. Wonder how this was ‘ripped’ already? So yeah, that’s it. 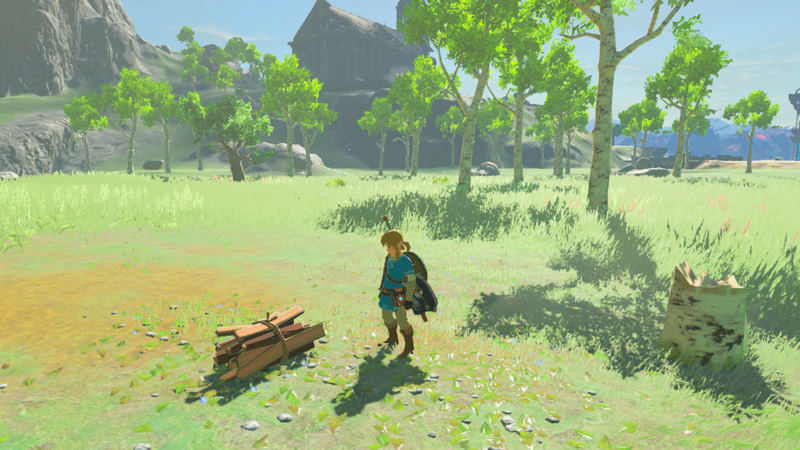 26 new screenshots of The Legend of Zelda Breath of the Wild, all showing the game at the highest quality level possible. Hope you liked them!